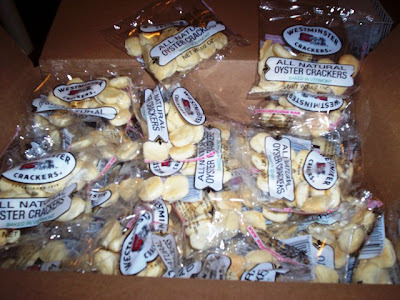 The wonderful folks over at Westminster Crackers have been in the cracker business since 1828. That's a long time to be making crackers. You know they wouldn't still be making them after all these years if they didn't have a huge following. Well, they do. That's because these fine crackers not only have a long rich history but are also a high-quality product. So we were delighted when they very generously sent us a box filled with 50 individual sized packages. You know I had to make some soup that night. Now I love these little crackers and am always thrilled to get them along side my soup in many restaurants. They are just crisp and airy enough to bob on top of your soup like little buoys floating in the water. They contain only seven simple ingredients - unbleached wheat flour, water, canola oil, all natural evaporated cane juice, salt, yeast, and baking soda. That's it. I love when you can actually list and pronounce the ingredients without having to use two sheets of paper - or a dictionary. Westminster also makes All Natural Old Fashioned Round Crackers and All Natural Hearty Square Crackers. The headquarters are located in Rutland, VT. THE VERDICT: Great! 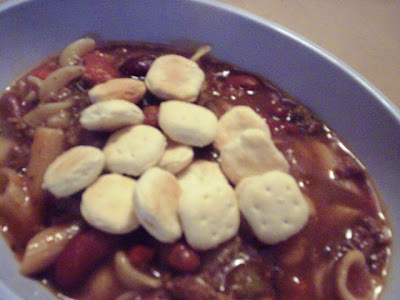 These little crackers are so fresh and tasty that hubby wanted to put them in a big bowl and just snack away, lol! They are that good. Buttery, lightly salted, and just crisp enough, these small gems make a great snack. But I love them in my soup and I know you will, too. Why don't you give them a try? For more information, visit WestminsterCrackers.com.